It has been called “the big ditch”, “the bridge between two continents” and “the greatest shortcut in the world”. One look at the immensity of the Canal, and you will understand why a French company with a labor force of 10,000 men went bankrupt trying to excavate it. The project, while conceived in 1534 by Charles I of Spain, began in 1882 and ended seven years later in disaster with over 22,000 people dead from disease and pestilence. The United States took over the assets of a French company in 1902 and began the process of finishing the canal. Sailing the Panama Canal not only offers a rich detailed and fascinating history narrated by an on-board Canal historian; it is the natural beauty that surprises most of all – an ever changing panorama of jungle clad hills, shimmering Lake Gatun, the high arched span of the America’s Bridge, and of course the intricate workings of the locks and gates themselves. From the deck of your ship or your own private balcony, you’ll marvel as the locks open one into the other. The locks are double to allow one ship to be raised while another is being lowered. 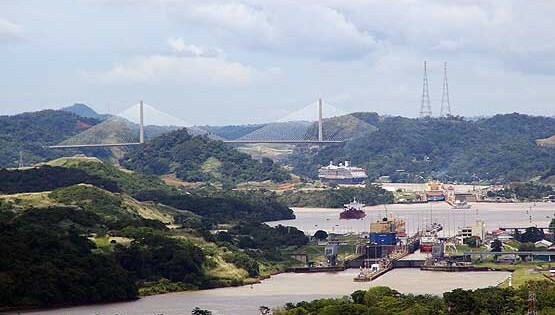 The lock chambers on the Panama Canal are 1000 feet long and 110 feet wide. Transit time through the canal is usually seven to eight hours. As a counterpoint, there is the natural wonder that surrounds the man-made one; a lush, virgin rain forest; impenetrable and inviolate, except for the canal. Imagine yourself watching the sun rise in the Atlantic and set in the Pacific. Visit Mayan ruins and colonial cities. Engineered as carefully as the Canal itself, these cruises combine just the right number of exciting ports with long, leisurely days at sea. And no matter which direction you go, you’ll discover a remarkable collection of wonders, both natural and man-made.